Applegate Farms is a major producer of organic and natural meat products. The Applegate brand features everything from cold cuts to bacon and burgers. Applegate was kind enough to send samples of several of their organic products for The "Q" Review. The first product to be reviewed is Applegate's organic Andouille. This spicy cajun sausage is made from organic chicken and turkey as well as organic herbs and spices. The sausages come fully cooked in a vacuum pack of four. The first thing I loved about Applegate's sausage was that I could actually read and understand the ingredients list. These organic products are free of the harmful nitrates and nitrites found in most processed meats. As the Applegate website recommends, I sliced up the andouille sausage for my jambalaya rice casserole. The spicy sausage meshed perfectly with the cajun inspired dish. Since the sausage is pre-cooked, I just added it to casserole as it finished cooking. I was pleasantly surprised with the taste of the sausage. The meat was very well seasoned. It also lacked that artificial processed flavor that many pre-cooked meat products have. It was so good, that I think I actually prefer it to the fresh sausage that I typically cook and add to my jambalaya. At just 140 calories each, they are certainly a healthier alternative. If you're health conscious and looking for a quick and tasty protein source for your family, pick up a pack of these sausages. Applegate Farm's products can be found in grocery stores all over the country. You can also order directly from the Applegate website. Click the title of this review to learn more about the Applegate product line. Check back with The "Q" Review over the next couple weeks for additional Applegate product reviews. See how their Andouille sausage compares to other meat products on the "Product Reviews" page. 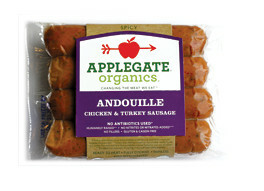 0 Response to "Applegate Farm's Organic Chicken & Turkey Andouille Sausage"